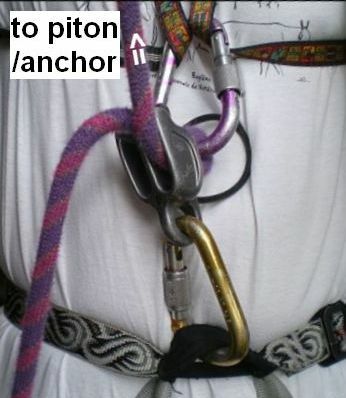 Climbing alone is even more dangerous (e.g., Serious Accident. 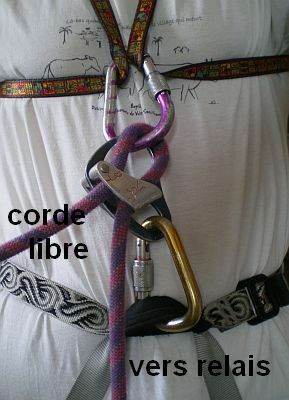 I use to climb integral solo without belaying, with two gold rules : being able to climb-down every step, and no objective hazard (no stones falling, solid rock). The method explained below is not recommended by device makers, and has no safety garanty: if you use it, it is your responsibility. 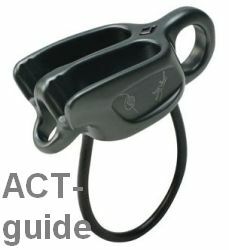 According to a device manufacturer, auto-blocking funtion is made to block the second climber: rope over blocks rope under. 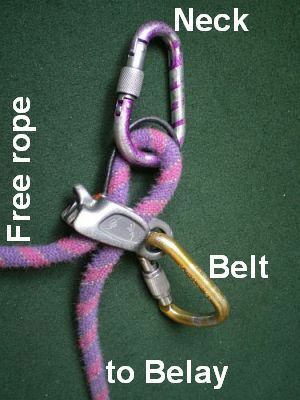 However, when a first climber falls, the huge energy will force rope over side-by-side with rope under. The rope-to-rope friction will make rope to melt, and breal.. The ONLY device I think is correct and safe is the Silent Parner, Wren Industries. But it is expensive ($250) and heavy (450g). 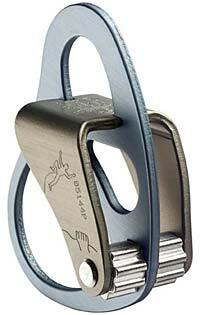 I do not use auto-belaying frequently enough to buy it, but I think you should. 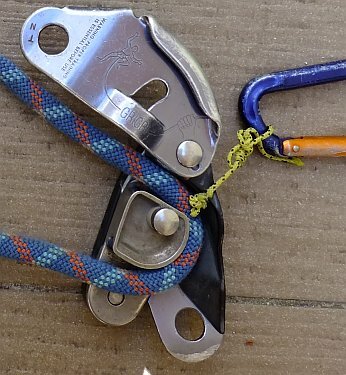 Well, after this necessary preliminary,let's explain: To belay I use ATC-guide or Reverso (used as the auto-blocking X, click climber on the left). 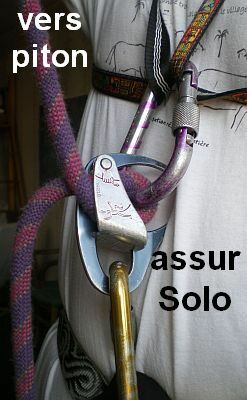 They are very similar, but for solo belaying, ACT is better. 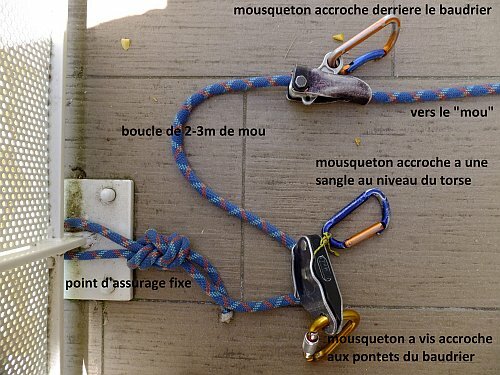 "My" method, explained below, comes from Epicurie, forum C2C 2004 (in French). 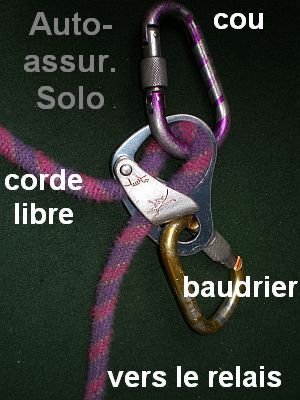 - The other rope end (the "climber" side on Réverso or ACT) is attached to an anchor at the belay down. 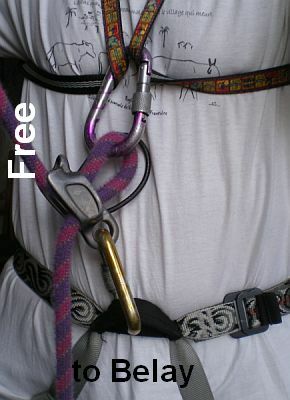 If the first steps from the belay are hard, insert a shock absorber or add some rope length for elasticity (tree, anchor below first peg...). Check the autoblocking properties by clipping your rope in a first anchor over your head: when you sit down, rope blocks you. See the listing on French page bottom solo.